Wendell Wiebe, Partner; Darryl Wiebe, President and Barry Derkson, Partner. Photo Rebecca Lippiatt Photography. 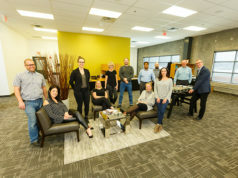 KERR Interior Systems Ltd. is a construction company specializing in light gauge steel studs, acoustic ceilings, drywall and taping, load bearing steel studs, and COMSLAB® and Ultrabond floor systems. This year the company celebrates its 40th anniversary. It all started in 1978, when Ken Rubin, Ed Wiebe, Russ McAuley, and Ron Creusot (whose first initials combine to KERR) decided to leave their employer and start their own company. At first, things went very well. KERR earned around $500K in revenue in its first year, and revenue continued to climb quickly until the recession in the 80s. Life, however, started to intervene. Creusot and Rubin moved away for personal reasons, and when McAuley faced health issues, he and Wiebe decided to sell the company to (Ed) Wiebe’s sons, Darryl and Wendell. Already long-term employees of KERR, the boys were happy to accept the offer. Their father continued on for three more years, and later, the family business would be joined by their uncle, Barry Derkson. Today, Darryl Wiebe is the company president. 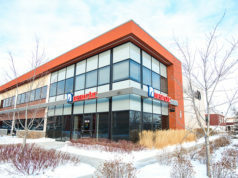 In the early 2000s, he incorporated computerization into the operations, and this caused the company to grow rapidly – but he’s not shy in admitting that the company has, at times, struggled. Stronger than ever, KERR re-established itself as one of the top interior system companies in Edmonton. Wiebe continues, “The biggest factor to our success and longevity is the fact that we can do a wide range of work. 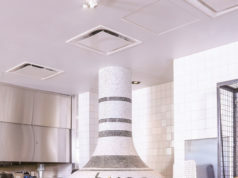 We will do projects in value from $1,000 to our largest of about $5M, and everything in between. “We work hard at training our staff and making sure as many as possible go through the Northern Alberta Institute of Technology (NAIT) apprenticeship program. This is extremely important to us. Our goal is to have our industry become certified, which means every journeyman must have a ticket. KERR has had someone on the Provincial Apprenticeship Committee (PAC – the governing body which controls and updates the apprenticeship program) for over 20 years. I served the maximum amount of time possible on the PAC, serving six years as a committee member and another six as presiding officer. We plan to always have someone on the PAC for Alberta. With four decades of hard-won success behind KERR, Wiebe pauses to think of some of the company’s milestones. “Opening our pre-finished panelizing factory in 2006/2007 was a huge accomplishment and very industry-leading at the time. Our most recent memorable moments include completing the Gran Villa and Starlight casinos for Clark Builders. Our team loved working on those projects because of the high level of detail and artistic work involved. Wiebe and his team are committed to giving each client an outstanding experience. Equal care is taken to ensure the staff remain safe on the job. The company is also very committed to staying efficient with the latest technology, something it achieves in a unique way. “We have recently created an internal ‘disruption council’ with one owner and four employees, where we have regular meetings to look at all types of new technology, methodology, and anything that can make us better and separate us from our competition,” Wiebe points out. The commitment to customer satisfaction, the outstanding safety record, the embrace of technology – it all cumulates in being awarded challenging projects that are integral to the fabric of Edmonton. Wiebe explains, “Peter Lougheed Hall is a new grad student residence at the University of Alberta. This project was all load bearing steel stud and COMSLAB products. It is very unique due to the small site size and the curved walls in the courtyard area. It also has a very interesting roof truss design. Giving back to the community is very important to KERR. Last year, the company donated labour to complete four units for the Carter Work Project with Habitat for Humanity. 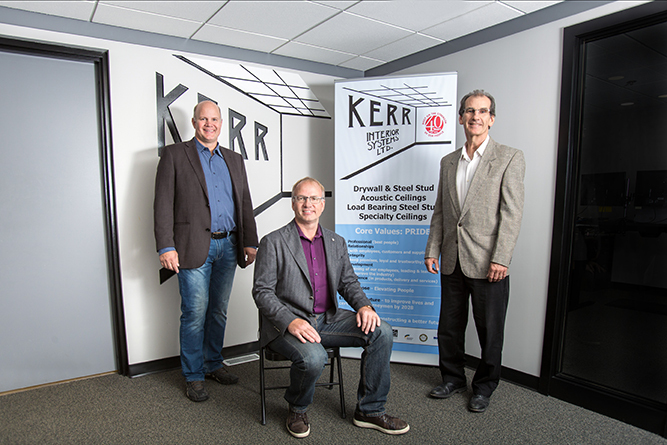 KERR also supports various charities thought the year, and the company recently contributed to the Show the Love campaign for the Cross Cancer Institute’s 50th anniversary. On behalf of the team and the past and present ownership, Wiebe thanks the Alberta Wall and Ceiling Association, Edmonton Executive Association, MacKay CEO Forums, and especially Results Canada for their positive influence in networking and personal and professional growth. Wiebe looks forward to the future of KERR and is open to how that future will develop.